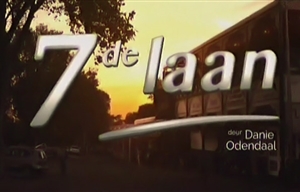 7de Laan is a South African Afrikaans-language television soap opera created by Danie Odendaal and produced by Danie Odendaal Produksies which is set in and around the fictional 7de Laan (Seventh Avenue) in the suburb of Hillside, Johannesburg where all the characters live or work. 7de Laan tells the story of a bustling community living in Hillside, their interactions with each other, the gossip stories which spread like wildfire, the love and laughter of family and friends and rivalry between Hilda and Matrone. In 7de Laan there is the Oppiekoffie Coffee Shop managed by Charmaine Beukes. It's a favourite hang-out spot for coffee and scones and a bit of gossip on the side. There is also the Deli run by the very sensitive Hilda, who loves nothing better than experimenting with different food combinations, unaware that nobody enjoys it. Hilda's arch enemy is Netta Nortje, the Matron of the Old-aged Home who is always on the lookout for a quick buck, usually with disastrous results. In the boutique is Inge who manages the shop with the help of Felicity, who designs some of the clothing for the boutique whilst running her business, Felicity Fashions. There are also the offices of the Hillside Times owned by Neville Meintjies, with two hot young journalists Mandla and Paula, who are both hell-bent on scooping each other for the front page. Also in Hillside is the Boekwinkel, a bookshop owned by famous Afrikaans writer Ryno Lategan and managed by his wife Emma, who enjoys writing short stories based on Oom Oubaas' hilarious tales of years gone by. The Theron and Terreblanche Sportshop in 7de Laan is owned by high society lady, Madel Terreblanche and the shop is run by her son Jan-Hendrik and her nephew Carlos Perestrelo. Lastly is the Events Management Company, Kyriakis De Lange, owned by George Kyriakis who handles most major events in the Laan with the assistance of Altus and Dezi. Things are not always as they seem in the Laan - as everyone goes about their daily business, they're unaware of the danger lurking nearby or a shady character prowling around just waiting to pounce on the unsuspecting residents of Hillside. The series is primarily in Afrikaans with English subtitles and occasional English and Zulu dialogue.